So quiet. So dark. Fearing she might be in her own grave, Maire couldn’t move for long moments, didn’t dare move, only the dull throbbing in her head convincing her finally that she was yet alive. But why then, did she feel as if she were smothering…? Jesu, Mary, and Joseph, the sun! Desperately she squeezed her eyes closed, but she could not shut out the horrible memories rushing in upon her. Pain, such dreadful pain, and blinding sunlight, and shrill feminine laughter that pounded within her skull like a thousand hammers. And Fiach, oh God, poor Fiach and the others…all slaughtered. Dead. Again she couldn’t move, her fear so sharp that she tasted blood from biting her lips. Where was she? Where were the Normans who had attacked them? Maire slowly, cautiously, lifted shaking fingers to just above her left temple, wincing at the sizable lump that ached dreadfully at her touch. She wondered then if she could sit up, even walk, for the wave of dizziness that assailed her when she lifted her head slightly and lowered the blanket to her chin, noticing out of the corner of her eye a low flicker of flames. Relief swept her, dulling some of her fear. She wasn’t completely in the dark. Yet the next moment she was stricken by confusion at her surroundings when she dared once more to lift her head. Saints preserve her, a bed? She almost laughed nervously at herself in the next instant, though her heart had begun to pound. Of course she lay in a bed if she were smothered in blankets, her head upon a soft pillow, a sturdy mattress beneath her—oh, God, where was she? Panic clawing at her, Maire gave no heed to her dizziness and lifted herself onto her elbow, her hair falling across her bare breasts. Bare…? Incredulous, she stared at her nakedness, her heart nearly leaping from her chest at the sudden shifting beside her. Maire froze, a heavy masculine hand covering her shoulder. She couldn’t blink, couldn’t breathe, crying out when she was pushed gently but insistently back onto the pillow. 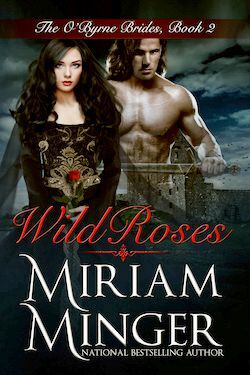 Maire’s shriek filled the air, her elbow grinding into her captor’s ribs with all her might as he swore in surprise and released her. Her only thought to flee, she lunged from the bed with such desperation that she forgot wholly her dizziness, forgot the limitations of her legs and went tumbling to the floor, tears of fright burning her eyes. Through her tangled hair she saw him come around the bed toward her, the Norman a hulking silhouette in the faint light and, Jesu help her, as naked as she! For she knew him to be an enemy, his marked accent one she could not forget.